Since all of the streams in the area are still blown out, I went over to a friend's house to fish the large pond behind his house. He needed to cut his grass and wasn't able to join me for the few hours on the pond. It was peaceful time since I was the only person around and casting 65' to blue rising on the surface. After landing about 35-40 Bluegill, I walked back up and sat on the deck with Jim for the remainder of the evening. What a great evening. 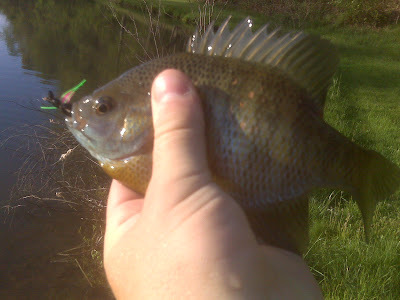 All that I fished that evening was a Black Foam Spider that I tied prior to leaving for Jimmy's pond. This foam fly has produced more than anything else for bluegill. And the best part is the durability.